Blog readers will remember the new JJ's Softy Play (in Stoneliegh Broadway) open day last Sunday. Hopefully several of you managed to make it down there with your little-uns. I had a call from Julia (one of the Js) yesterday afternoon to tell me that George and Bungle from Rainbow (you know that TV show with zippy et al in it) will be there to launch their first proper day of being open this Monday (10th February). Doors will open at 9:30am but the official launch will take place around 10am. 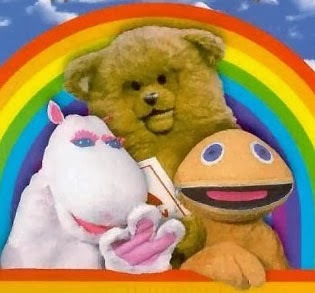 The reason for the Rainbow connection ("Why are there so many songs about rainbows"... ahem) is that Julia used to work for the Rainbow Trust charity which is a charity for children with life threatening or terminal illnesses. JJ's has decided to remain closed to the public on the first Monday of each month, and open up the soft play for free for these children and their brothers and sisters. So as a thank you, the charity is sending over the rainbow mascots for the grand opening on Monday.